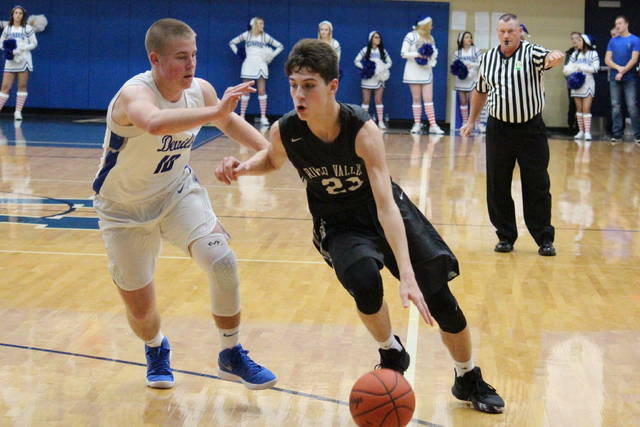 Gallia Academy sophomore Zach Loveday (32) drives past River Valley sophomore Matthew Mollohan (21), during the Blue Devils’ 68-28 victory on Friday in Centenary, Ohio. 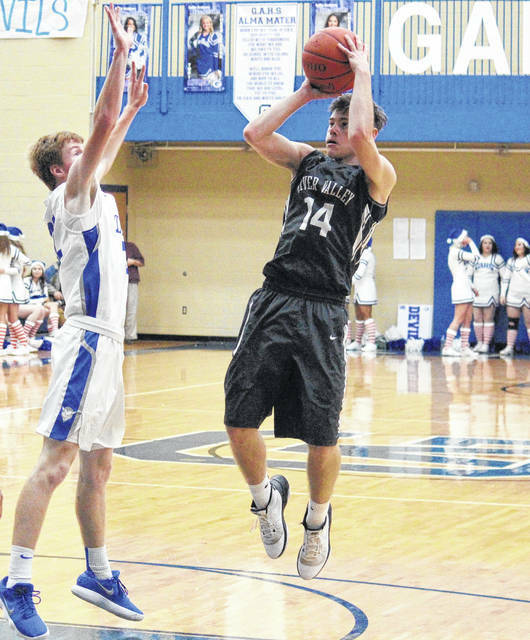 River Valley sophomore Chase Caldwell (14) shoots a two-pointer over Gallia Academy junior Cory Call (left), during the Blue Devils’ 68-28 victory on Friday in Centenary, Ohio. CENTENARY, Ohio — Talk about a bounce back. 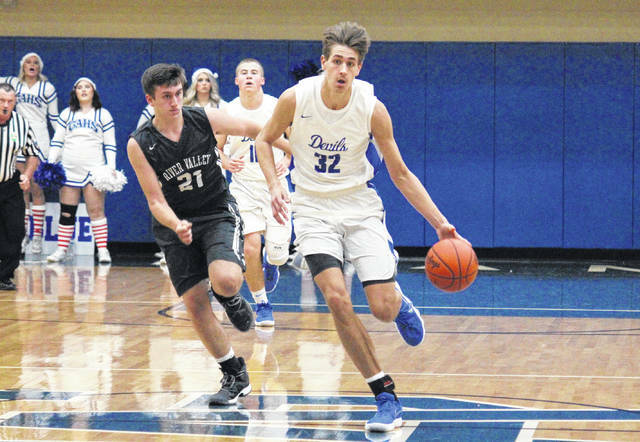 The Gallia Academy boys basketball team rebounded from its first setback of the season with a 68-28 victory over in-county rival River Valley on Friday evening at GAHS, as the Blue Devils came up with their best defensive effort of the year. The Blue Devils (6-1) never trailed in the game, scoring the first eight points of the night in the opening 2:30. Over the final 5:30 of the first quarter River Valley (2-7) outscored the hosts by a 3-to-2 edge, and the Raiders began the second quarter with a 4-2 run. The hosts ended the first half with a 19-to-5 spurt, however, and headed into the break with a 31-12 advantage. The Blue and White continued to build their advantage in the second half, outscoring the guests by a 17-to-7 tally in the third quarter to make the margin 48-19 with eight minutes to play. 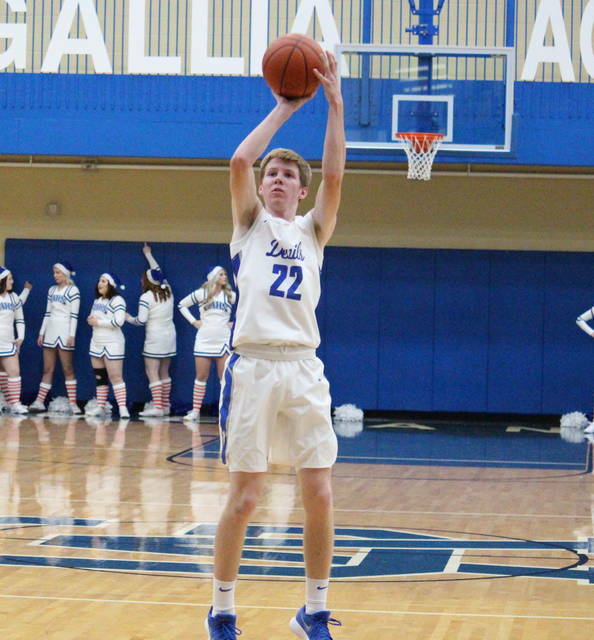 Gallia Academy closed out its 40-point victory with a 20-to-9 run in the finale. “We had a bad taste in our mouth from the Fairland game,” GAHS head coach Gary Harrison said. “We had two great practices leading up to this game, the kids worked hard, they were in tune and they were in touch. We’ve played good defense all year, we ran into a buzzsaw at Fairland and I think that is what it is, we learned from it. GAHS shot 30-of-56 (53.6 percent), including 8-of-22 (36.4 percent) from beyond the arc, while RVHS was 11-of-49 (22.4 percent) from the field, including 4-of-24 (16.7 percent) from deep. The Blue Devils didn’t attempt a shot from the free throw line, where the Raiders were 2-of-3 (66.7 percent). The Blue and White outrebounded their guests by a 32-25 clip, despite RVHS claiming a 9-7 edge on the offensive boards. Gallia Academy committed just five turnovers, 10 fewer than the Raiders. The hosts also enjoyed advantages of 28-to-3 in assists and 9-to-5 in steals. Both teams blocked two shots in the contest. GAHS sophomore Zach Loveday led the victors with a double-double effort of 17 points and 10 rebounds. Loveday also led the Blue Devil defense with team-highs of three steals and two blocks. Cory Call and Kaden Thomas scored 13 points apiece for the hosts, Justin McClelland chipped in with eight points, while Evan Wiseman had six points and a game-high seven assists. Logan Blouir, Gage Harrison and Bailey Walker scored three points apiece in the win, while Caleb Henry marked two. McClelland hit a pair of three-pointers for the Blue and White, while Loveday, Call, Thomas, Blouir, Harrison and Walker each drained one trifecta. The Raider offense was led by Jarret McCarley and Layne Fitch with six points apiece, followed by Chase Caldwell with five. Patrick Brown had four points for the Silver and Black, Rory Twyman chipped in with three, while Matthew Mollohan and Kyle Coen marked two each. Fitch hit two triples for the Raiders, while McCarley and Caldwell made one apiece. McCarley led the guests on the boards with seven rebounds, while Caldwell, Fitch and Brown each had an assist. Brandon Call led the RVHS defense with three steals, while McCarley and Mollohan blocked a shot apiece. The Raiders have one more contest before the new year, as they visit South Point on Dec. 29. The Blue Devils will be off until Jan. 5 when they host Coal Grove. The rematch between GAHS and RVHS is set for Feb. 13 in Bidwell.